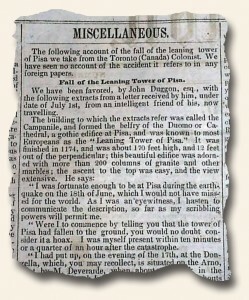 The headline reads: “Fall of the Leaning Tower of Pisa”. Obviously it piqued my interest. I just had to read the report. The letter was written by an eye-witness who was: “…an intelligent friend…now traveling…”. 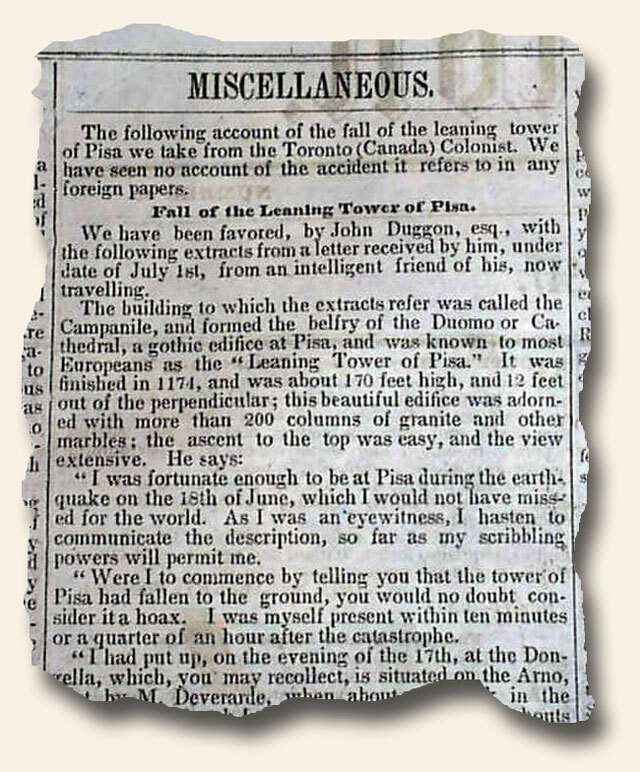 This report notes in part: “The building to which the extracts refer was called the Campanile…a gothic edifice at Pisa & was known to most Europeans as the ‘Leaning Tower of Pisa.’ It was finished in 1174…I was fortunate enough to be in Pisa during the earthquake…As I was an eye-witness, I hasten to communicate the description…about 7 o’clock in the morning…was suddenly awakened by shouts…The Campanile, or Leaning Tower…has now become, I may say, almost a total ruin, having fallen to the southward…The centre is a completely mutilated ruin…The marble pillars…were very much shattered…” and even more. This was obviously a hoax, but it is interesting the extend of detail the writer shares in an attempt to make his report believable. See the hyperlink for the full report, found in “The Daily Union” newspaper, Washington, of Aug. 14, 1847.